The laughter only grows as I start to grunt and sequel. My body has no where to go, the only thing I can move is my left hand which dangles in an open space ahead of me. I feel like a baby trying to escape a rock womb, only the stone isn’t pushing. I’m stuck in a tiny hole, deep under the city of Budapest in its intricate system of caves, and I don’t think I can get out. Feeling the need for some excitement in our lives, Tiffany and I jumped at the recommendation of a friend to go caving in the Buda Hills of Budapest. The tour of the caves started pretty standard. We climbed down a sturdy steel ladder, and wandered into cave rooms ten feet high and thirty feet wide. At certain points we had to get down on our knees, or slip down a natural slide. 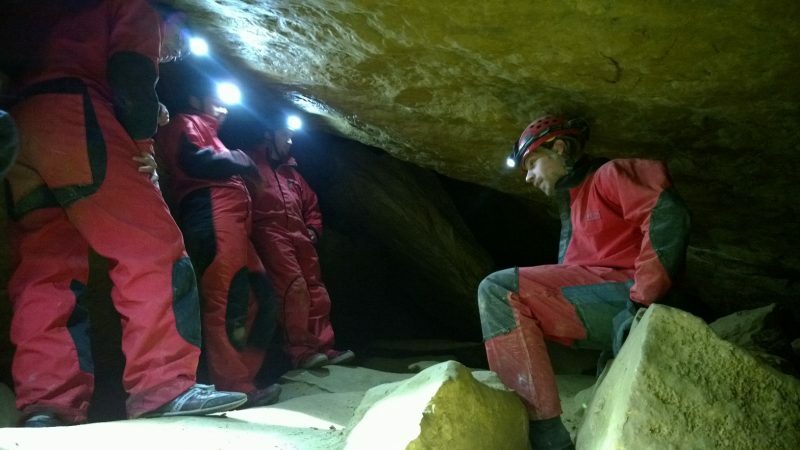 It was all fairly standard caving. Moreover, the scenes under Budapest were unreal. The cave is beautiful mess of stone and clay. 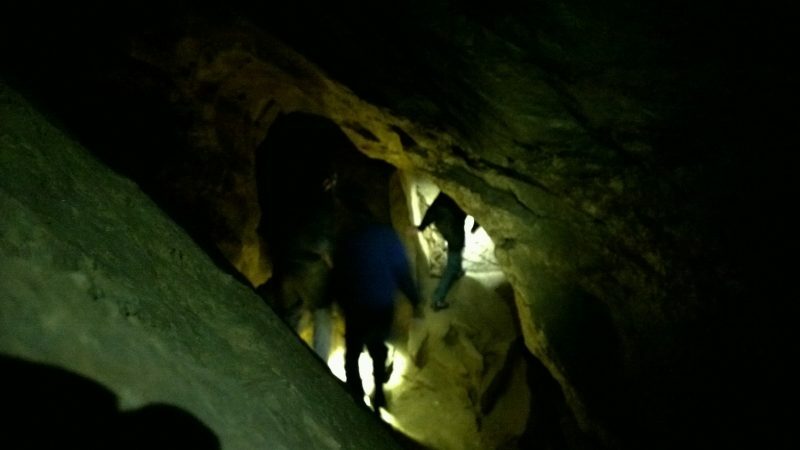 Though pitch black, there is something lively about caves, something powerfully ominous and inspiring about them. 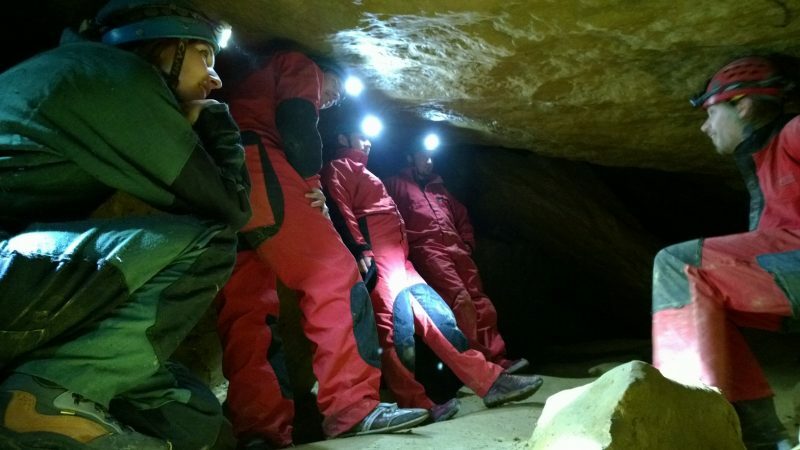 Caving is one of the experiences that allow us to explore truly foreign territory, geography, and geology. Each section of wall shows a different face. Like watching the clouds, the cave walls seem to bend into shapes and figures. Big open rooms are awe-inspiring. But as I lay here stuck, there’s not enough air in my lungs to awe at anything. Before pushing into the rock-walled tunnel, I watched Tiffany go ahead of me and skim through the tiny hole in the cave without a problem, I figured it couldn’t be too bad. But right now, I really wish I was a 110-pound girl. With my somewhat free hand I manage to get two fingers on something sturdy and somehow pull myself 2 inches farther ahead, but I only feel 2 inches more stuck. My whole body wants me to panic, but even if it did it would have nowhere to go. 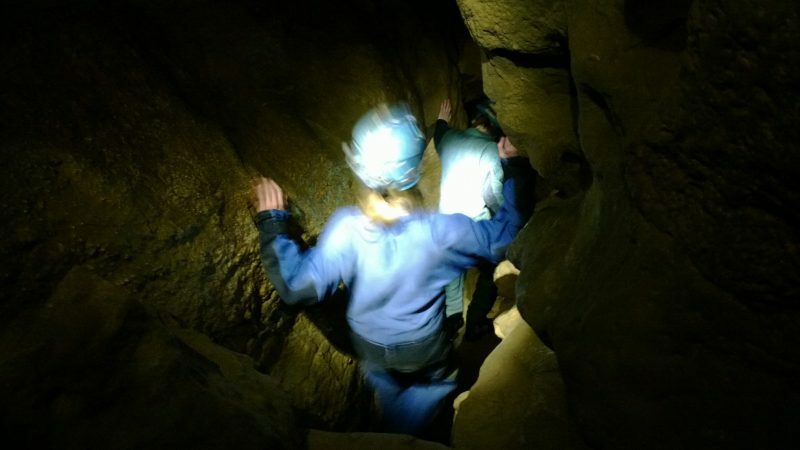 Moreover, the more I wiggle, the more I drop down into the crevasse of the cave rather that through the hole I need to go through. Still no one offers to help, and again all I hear is laughter. I push my toes into the ground and try to use them to move me forward but they just slip and I barely move. I peek the end of the 4-meter hell hole and realize I still haven’t even made it to the point where I have to twist my body 90 degrees to get out. I might only have a meter to go, but it feels like miles. I keep pushing with my fingers, I continue to feel suffocated and I’m sure some of the strangest sounds ever heard come pressing through my lips along with my fair share of cursing. Eventually my squeals and grunts manage to push my torso through the hole and the group waiting for me at the other end can see my red face. The feeling of panic is replaced with relief. Once I’m through I just lay there sprawled on my stomach laughing hysterically. The group sits there chuckle at me. They have that same mixed look of pride and relief on their faces as we all laugh about getting through. My whole body burns as we make the finish through the caves. After pushing it through the tunnel, every hole in the cave looks like a canyon, but at the same time I don’t trust the caves anymore. Finally, as the gates to the cave open up and we are let into the fresh drizzle of open air once again, I’ve never felt more happy with a breath of oxygen. 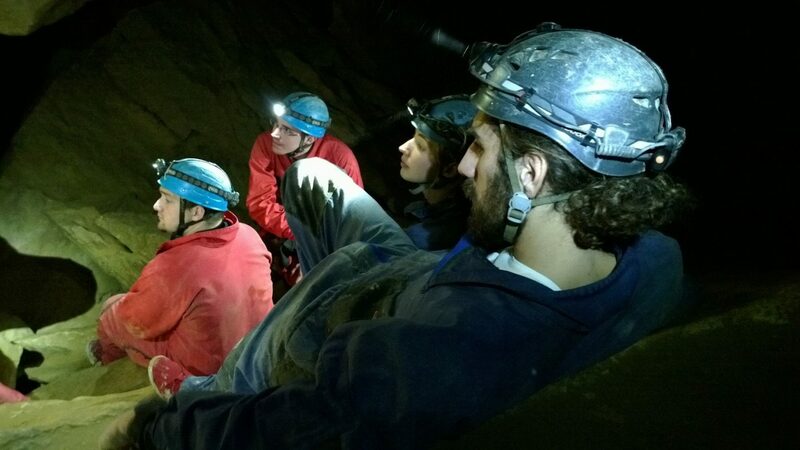 Caving in Budapest was the unexpected adrenaline boost I needed. It was a reminder that there’s so much more to offer in Europe than just the big dull cities. It was the reminder that I needed that it’s often not the destination but how deep you dig to explore it. Love the story bud! Glad you got some good shots of it as well. Pretty sure that’s the same spot I got stuck (while doing the Superman). Even reading your story and seeing the photos again brought back goosebumps and a tightness along my spine. Yeah Alex, “The Superman” is the style in which you push through a tunnel… and yeah, that’s exactly what I was doing. I can’t remember the name of the tunnel, but it was insane! Thanks again for the tip. Glad you share your story Brendan! Hope you feel okay now. Bad thing you got this mishap. Definitely not a nice story but glad you lived through it. I stumbled upon your blog while searching for something related to Ecuador and I landed on the page about your story of getting robbed. I’ve been in Quito for 2 months now and have recently been pick-pocketed. They only took my phone luckily, but I totally share your pain man… I’m going to Tena next week probably on the same bus as you did. I’m not gonna let go of my bag for a split second… Thanks for sharing that story and giving me a heads up! Anyway, I’m following your RSS, you’ve got some great stuff going on here! Your photos and stories are absolutely wicked! Can’t wait to read more.